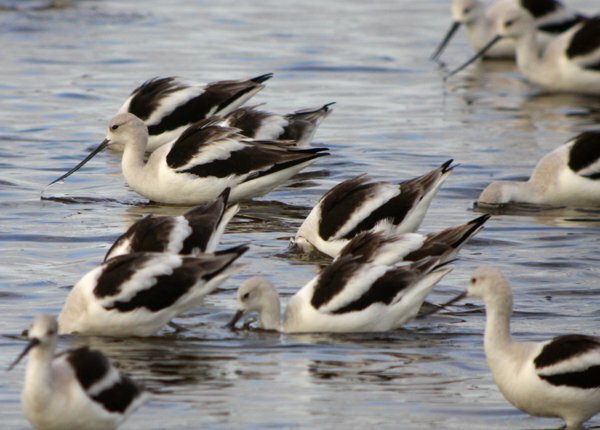 We New Yorkers get excited about single American Avocets showing up in our state and when more than one avocet is around we can’t help but go take a look. Theoretically, we understand that sometimes Recurvirostra americana show s up in larger groups than that but we have a hard time visualizing such an occurrence. 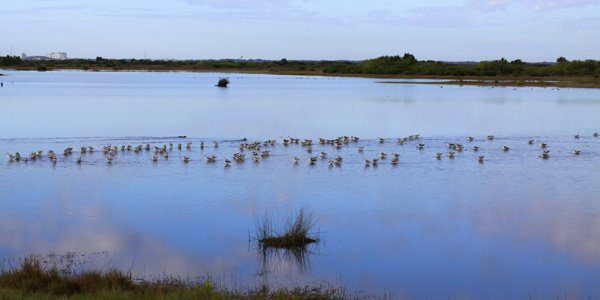 Having now visited Merritt Island National Wildlife Refuge in January this New Yorker will never have that problem again. 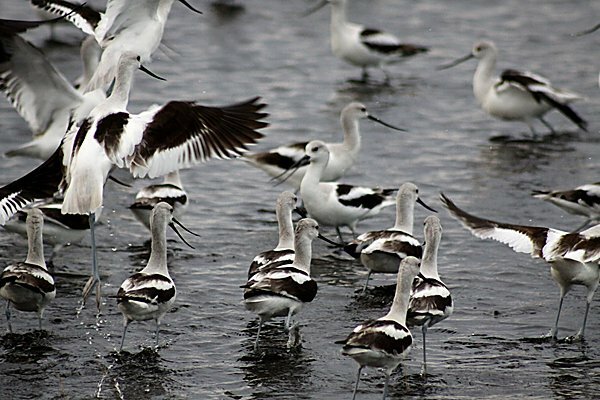 I had only been in Florida for about fourteen hours when a herd – yes, a herd, not a flock* – of American Avocets was foraging its way across the shallow water in front of me. 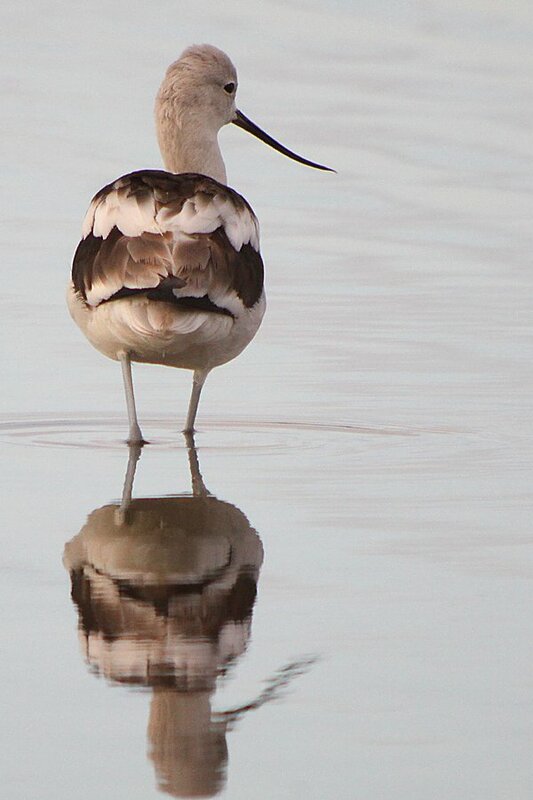 Even in their basic plumage and lacking the cinnamon plumage of breeding birds they are beautiful. Long and lanky and graceful – all legs and bill and seemingly little else. 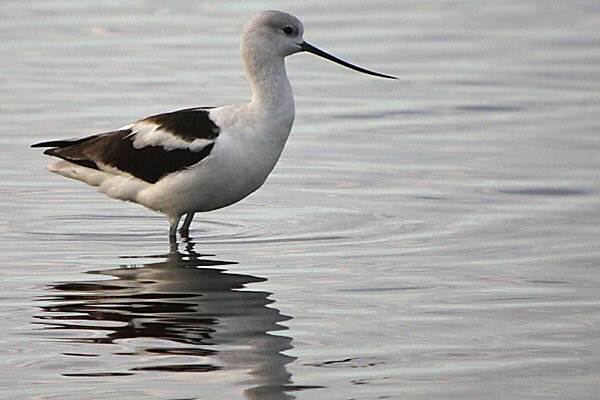 Watching avocets forage is fun and watching a flock forage is a far better way to spend your time then, well, pretty much anything. 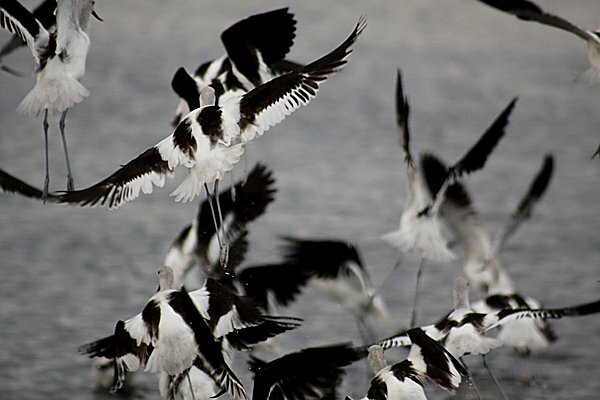 They tend to start all grouped together and heading in the same direction in an arrowhead formation but gradually lose track of each other as they move along until they are all moving different directions and have spread apart as they swish their upturned bills through the shallow water. Then they tend to gather back together again, often moving to a different location to look for more food. All of these shots were taken at Merritt Island National Wildlife Refuge on Black Point Drive, an excellent wildlife drive that offers great, close looks at some awesome birds and other creatures. My trips around the auto loop were on 26 and 29 of January 2012 and the first three pictures below – as well as the images of individual birds above – were from my first visit while the more monochromatic shots were from my second visit. *I tend to think of large groups of non-dickey-birds walking on the ground together as herds. I dig the shot where they foraging directly at you…be careful. 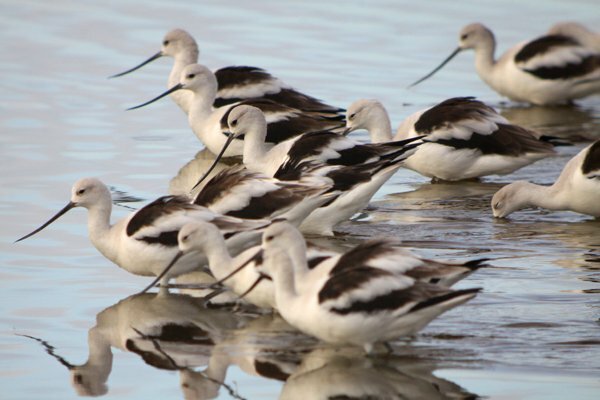 Have you scheduled the 10,000 Birders Florida 2012 convention yet? 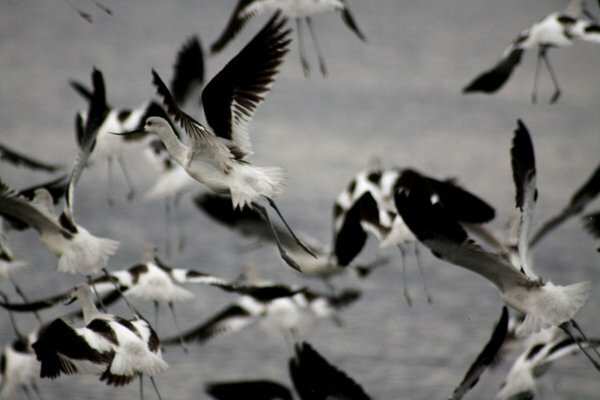 Those avocets are dangerous! And we’re still looking for a place with both good alligator jerky and a swimming pool we can fill with vodka. Not an easy combination. The charge of the flight brigade! @Jochen: C’est magnifique, mais ce n’est pas la guerre.